Summary: Lena navigates a dangerous path in the Wilds as a resistance fighter. Her best friend, Hana, lives a safe, loveless life in Portland. 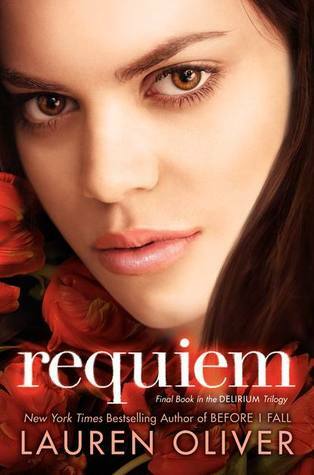 Told through both voices, Requiem hurtles back and forth across the walls that divide them. Until, at last, they collide. I swallow back the sick taste in my mouth. "Well, I'm not your responsibility either, remember? You can't tell me what to do." I've found the thread of anger again. Now I'm following it, pulling myself forward on it, hand over hand. "Why do you even care, anyway? You hate me"
Alex stares at me. "You really don't get it, do you?" His voice is hard. I cross my arms and squeeze tight, trying to squeeze back the pain, to push it deep under the anger. "Don't get what?" "Forget it." Alex shoves a hand through his hair. "Forget I said anything at all." Ooh nice! Haven't read this series but my sister has and is eagerly awaiting this one! AH. Cannot wait for this book! I kind of love Alex. I haven't read this one either, but as I sit here with one hand shoved through my hair, I somehow feel compelled to give it a try. AHHHHHHHHHHHHHHHHHHHHHH! I am so so so jealous!!! This is my most anticipated rad ever! LOL Well as long as poor Alex forgives Lena and they get back together!!! If she ends up with Julian *barf* I will not read it!!!! OMGOSH! I cannot wait for this book! I NEED TO KNOW WHAT HAPPENS!!! Eeek! Sigh, alas I will have to wait along with the rest of the world! Great teaser! OMG!! Awesome teaser!! I can't wait until this comes out!! I am dying to know what will happen. I know that my heart will probably be ripped out and patched together again in only the way Lauren Oliver can do!! Awesome teaser! I am absolutely dying for this book! I cant wait to know what happens!! !